Significant tenement within the tightly held Tropicana belt. Along strike from the Tropicana Mine with a combined resource of 114Mt @ 1.95g/t Au for 7.2Moz Au. Previous work is sparse and potentially ineffective. Development of the Tropicana Mine will enhance the economics of other mineralisation in the Tropicana Belt. Dynasty Resources Ltd (Dynasty) have a tenement that sits 32km North east along strike of the world class Tropicana gold deposit. This exploration license covers 48km2 in the Mt Margaret Mineral Field, 370km North East of Kalgoorlie. Previous work in this area has focused on Gold mineralisation and a number of gold prospects have been discovered adjacent to this tenement. Existing geochemical and drilling studies have been limited to shallow auger and Aircore with minor anomalism returned (max 146ppb). The area is dominated by felsic intrusive and gneiss with mapping showing low angle unconformity structures. 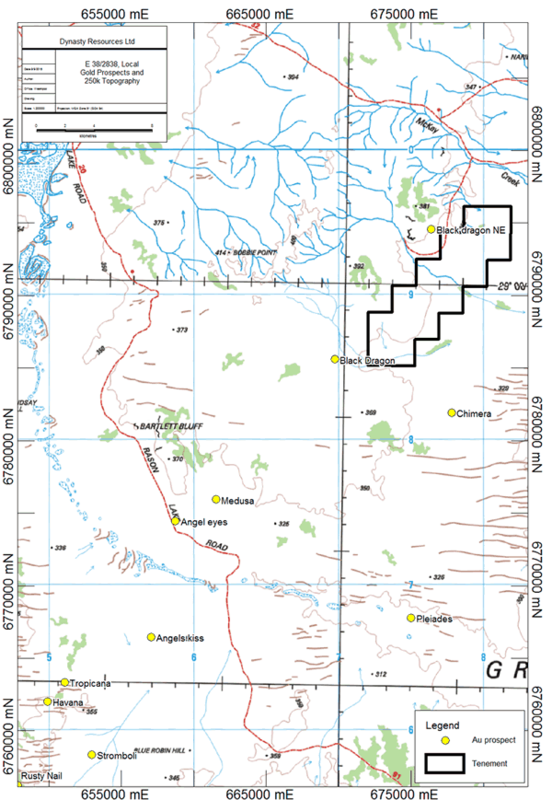 Mineralisation at Tropicana is contained within 30° south east dipping zones with associated biotite alteration. A number of untested anomalies remain in the Tropicana project area which have the potential to host economic gold mineralisation. The best intersections from the drilling are associated with magnetic highs in the area and potential for fluid movement along the edges of these highs is also possible. Most of these magnetic targets have not been tested by surface sampling or drilling and those tested may not have been tested to sufficient depth. 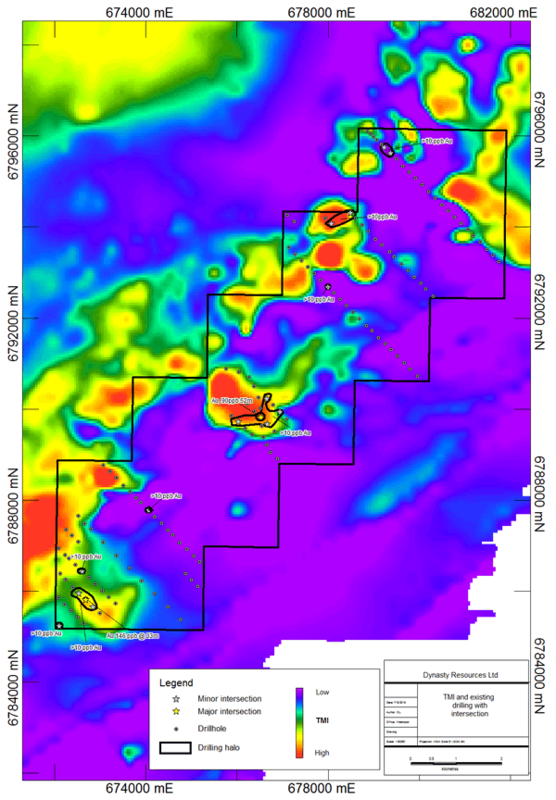 The Auger sampling completed to date has shown little anomalism which may be due to the sampling method, weathering and transported cover as opposed to the absence of mineralisation. Surface expression at Tropicana was reportedly very subdued (max 31ppb Au) with little supergene anomalism present. As such we consider the tenement to be underexplored with significant potential for discovery of a mineralised system. The Tropicana project sits adjacent to the Northern part of the NE striking Albany-Fraser orogenic belt located in South East, Western Australia. This Belt is located on the South to Southeast margin of the Archean Yilgarn Craton, this belt is interpreted to be the suture between the Yilgarn Craton and Proterozoic Albany-Fraser province which stretches over 500km. The Albany-Fraser Belt is separated into fault‐bound zones, defined by distinct lithologies and tectonic histories. Lithologies dominantly comprise gneisses of amphibolite to granulite facies with reworked Archaean or Proterozoic affinities and granitoids metamorphosed to greenschist facies (Bennett, 2013). The Tenement sits in the Northern Foreland Zone comprising reworked Yilgarn lithologies, and the Biranup Zone of dominantly reworked Archaean and Proterozoic gneisses and metagranites. The orogenic belt and associated fabrics trends northeastwards in the region, in contrast to the pervasive northwest trend of the adjacent Yilgarn. Late‐stage Proterozoic dykes are common and strike east‐northeast, at low angles to the main Albany–Fraser tectonic suture. Basement outcrop in the project area is rare, Cenozoic regolith covers majority of the area. The magnetics in the area shows a contrast between a higher magnetic unit and a lower magnetic unit with the contact between the two being a potential focus for fluids. A series of northwest structures seems to displace this contact and these are also target zones. (Figure 7). Drilling to date has been broadly spaced and may not have been drilled to sufficient depth as shown in Figures 8 and 9. Deeper drilling in these areas may give a better understanding of the potential distribution of mineralisation in the region.